Crop circles are so 1990s. Nowadays, my favorite mysterious, creative phenomenon is snow art. Did aliens make it? Does it indicate some old druid structure hidden beneath the snow? Or is it just down to some insanely creative artist? Err, yeah, you guessed it: it's the last one. 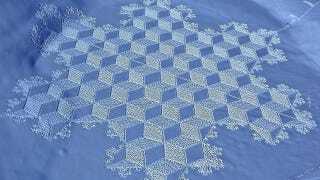 In fact, these abstract images in the snow are inspired by crop circles, and are produced by Simon Beck. On his Facebook page, he explains that he manages to "create [them] by walking in the snow wearing briquettes (snowshoes)."